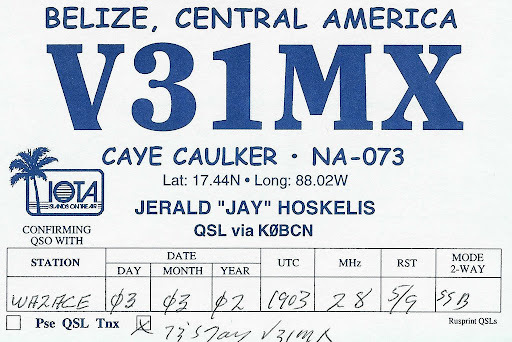 Operators Henry/W5HNS, Jay/K0BCN and Marty/W5MRM will be active as V31WH, V31MX and V31MO, respectively, from Cay Caulker (NA-073). The team will arrive on July 23rd, and possibly be on the air that day. They will return to the U.S. on July 31st. Activity will be on 40-10 meters using a 5 band hexbeam and a 40m dipole, operating CW and SSB. Jay and Henry are the CW ops (as well as SSB) and Marty will operate on Phone. Nothing has been decided about PSK or RTTY yet. There will only be one transceiver, so they will not be on more than one band at a time. During the RSGB IOTA Contest (July 28-29th), they will sign V31MX and be on the contest allowed bands alternating SSB and CW (on 40m and up). QSL via their home callsigns or LoTW.